*Eccentric adjustment of chuck on mounting plate to obtain required TIR on the workpiece may result in unacceptable vibration at these speeds. Reduce RPMs accordingly. Jaws must be fully engaged in the chuck body. A B* C D E F G1 G2 H K Min. ** Max. 5" 5.00" 2.375"¨ 1.30" 2.84" .66" 4.44" - 5.00" 1/4" 1/16" 4"
6" 6.31" 3.125" 1.81" 2.88" 1.59" 0.69" 5.34" - 7.31" 1/4" 3/16" 5"
8" 8.25" 4.750" 2.25" 3.25" 1.75" 0.75" 7.50" - 9.25" 3/8" 3/16" 6-1⁄2"
10" 9.85" 6.375" 3.00" 3.63" 2.13" 0.81" - 4.38" 11.00" 7/16" 3/16" 8"
12" 12.20" 7.906" 4.06" 4.00" 2.28" 0.84" - 5.25" 14.00" 1/2" 3/4" 10"
15" 15.74" 11.7812" 4.56" 5.13" 3.16" 1.13" - 6.75" 17.00" 5/8" 1-1⁄2" 13"
18" 18.00" 11.781" 5.04" 5.781" 3.27" 1.125" - 6.75" 19.00" 5/8" 1-1⁄2" 16"
24" 24.00" 16.030" 7.025" 6.530" 3.27" 1.188" - 9.25" 25.00" 3/4" 2" 22"
*Tolerance - .000/+.001 **6-Jaw Chuck minimum grip, consult factory Recess can be opened up to 2.745" - 2.755"
® Ajust-Tru is a registered trade mark of Illinois Tool Works. PBA offers a full line of Mounting Plates type "D", "A", "L" and threaded plates for the "SETRITE"® Chucks. PBA Mounting Plates are interchangeable with other popular adjustable universal style Chucks. Mounting plates are precision machined to suit the spindle nose of your machine. 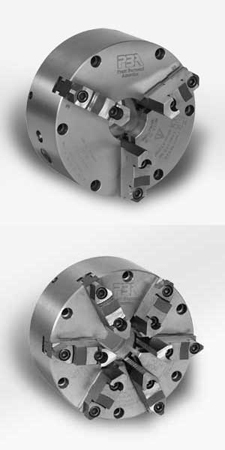 For maximum accuracy of "SETRITE"® mounting plates, mount plate on machine spindle nose, place a dial indicator on the chuck side face of the adapter close to the mounting holes, rotate the adapter and if the total indicator reading (TIR) exceeds .0005" take a light truing cut across the face of the mounting plate. ﻿Type D Mounting Plates "Camlock"
Spindle 6" 8" 10" 12" 15" 18" 24"
﻿Spindle 5" 6" 8" 10" 12"
*Threaded adapter plates and special plates are available upon request. "SETRITE" chucks and adapters are shipped unassembled unless ordered assembled at extra charge. When ordering special adapters give make, model number, size, and spindle dimensions of machine.